Oil bulls aren't exactly common these days. In fact, it's likely that oil will head even lower than $28 a barrel before it climbs any higher – and that's almost certain to take some time. But that doesn't matter to me. I'm not in the business of calling bottoms: I'm in the markets because I love to trade and I love to make money. That's why I was so excited to find this oil and energy pattern. It's unlocked the potential of nice profits even with cheap oil. I study patterns intensely, all the time. 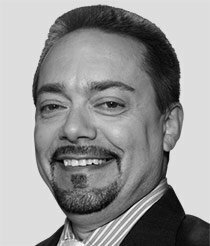 I look for repeatable, convincing patterns – patterns that recur often enough to capitalize on. It doesn't really matter whether the pattern plays out over three days or six months. Once it's proven and back-tested to work, it goes in my book of trading strategies. Now, it just so happens that many of the patterns I use are seasonal; they happen at specific times each year. Like the seasonal energy pattern. I've found that oil and energy gain momentum and surge smack in the middle of February and that the bull run tends to play out by mid-July. In fact, the pattern shows, on average, a 10% move higher over that date range. Those are respectable gains in any market, but they're downright great in this creeping bear market. But we can do even better with options, parlaying that 10% move to the upside into a 100% gain – or better. So we've found the commodity, and we've found the pattern. Now we need to find the right security to trade and the right option to really pull in the profits. Here's how we're going to do that. 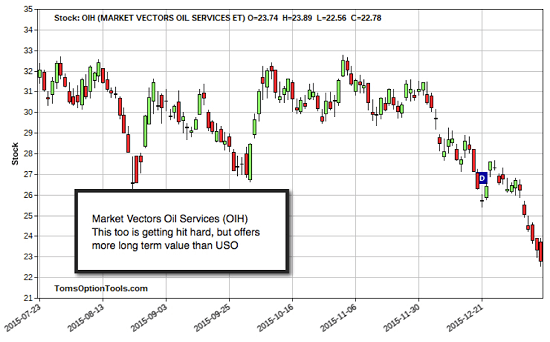 Take a look at the chart for Market Vectors Oil Services ETF (NYSE Arca: OIH). This exchange-traded fund (ETF) tracks the price and performance of 25 of the largest U.S.-listed, publicly traded oil services companies, but it's subject to a lesser degree of downward pressure versus those funds that actually own the black stuff. This is the ETF I like best for trading options on the seasonal energy pattern. There are others, like the United States Oil Fund LP (ETF) (NYSE Arca: USO) and the Energy Select Sector SPDR (ETF) (NYSE Arca: XLE), but the Oil Services Fund is the one I "hang my hat on." There's too much oil on the market, but the world still runs on it, so it will eventually move significantly higher. The seasonal energy pattern shows crude jumps by 10% more than 75% of the time since 2000, and I really like those percentages.